"This week, we travelled to Kampong Speu province, to the town of Aoral. Approximately a 2.5 hour drive from Phnom Penh. Back in Kampong Speu and have discovered much more than when I first did. Well definitely not a tourist destination with barely any locals having the command of English. It a really nice location for an away-from-the-city spot." Kampong Speu (literally: "Port of the Carambola.") is the capital of the province of Kampong Speu. Speu is the Khmer word for starfruit (also called carambola), but Kampong Speu is actually famous for its palm sugar and wine. The landscape is varied. It has a large area of lowland rice fields in the east to upland forested areas in the West. Cambodia's highest mountain, the Phnom Aural with 1813m altitude in the extreme north of the province. 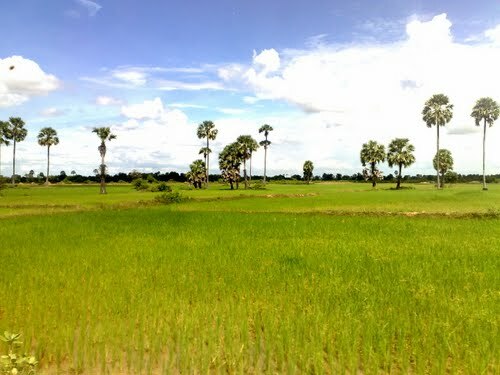 Kampong Speu is considered a rural county. The majority of people in the capital only speak Khmer. In some stores, however, they speak Mandarin (usually on the small coffee shops / restaurants or shops). The center of town is a large market, surrounded by bike shops, a pharmacy and small restaurants. There is a guest house (Pheng Ang Guesthouse) just minutes from the market. It is very common in Cambodia that every big city has several markets. You can also find these markets in Kampong Speu. These are very busy with local shops / stalls where one buys the local daily consumer products, like fish, fruits, vegetables, meats and packed products. All restaurants are located near the market. If you want a special souvenir from this province you should buy a bottle of wine palm sugar. Kampong Speu has numerous private schools and orphanages lead by social and missionary organizations in Singapore, the Philippines and other countries. The economy of Kampong Speu runs mainly of rice, fruit harvesting and catching fish (Tonle Sap lake). It is also known by its famous palm sugar and wine. Especially the rural households depend on agriculture. The places Tang Tonle and Ampe Phnom lie at the border of the Tonle Sap lake. 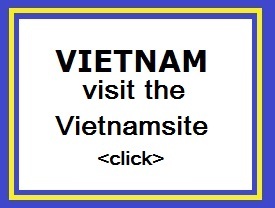 They are located 48 kilometers from the city of Phnom Penh. The recreation area has few natural rivers, especially the larger Preaek Thnot river, where many large trees growing along. 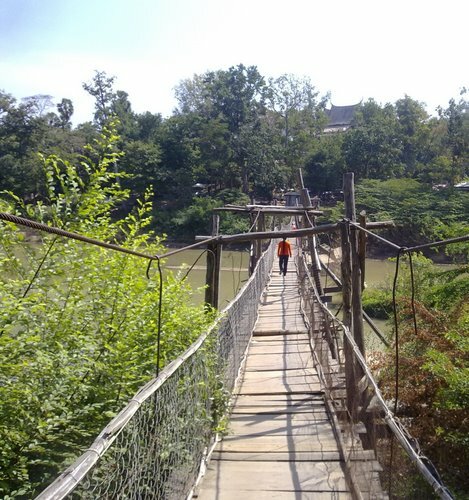 At the foot of the mountain is a rocking bridge linking the villages Tang Tonle and Ampe Phnom together. There is also an ancient pagoda on the hill where the Cambodians come to worship their gods. During traditional festivals At Ampe Phnom, tourists can swim, walk on the rocking bridge and resting on the banks of the river. 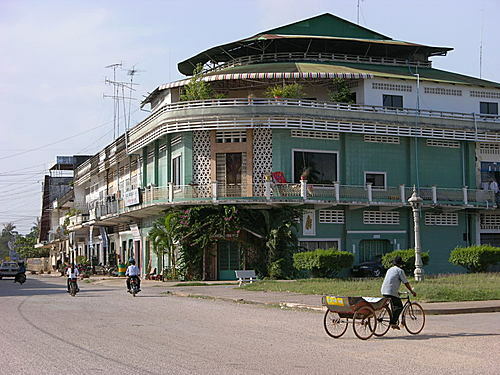 Kampong Speu is also a place of coffee shops and restaurants. You can have a hot cup of coffee while chatting with friends and even making a new friendship. However, most of people speaks the Khmer language except those in the service industry. About the history of Kampong Speu, this town became a tourist city and holiday resort from the middle of the 1940s. Initially, Kampong Speu is adorned by species which is imported from Japan like hot grottos, a cool breeze and cascade and pines. The main attraction in Kampong Speu is its wine and sugar palm and you are a wine lover, Kampong Speu will be your ideal place. Palm sugar wine is commonly seen here and it has a incredible flavour that may set your tongues on fire. Kampong Speu town is just 40km from outskirt of Phnom Penh. You can reach here by a bus to the Kampong Speu Town along the National Highway No.4 with less than 10$. The road is very good, especially from Phnom Penh. There are many things you can do and see in this town. Swimming is the major activities in Kampong Speu. You will be free to cool your body with rivers here and enjoying the surrounding view with large trees and rich vegetation. Besides, there are some rock bridges where you can feel the cool wind of Cambodia. If you want to have a true relaxing, you can visit the collages along the river banks.